the nytpicker: Live-Blogging Jill Abramson: "The Times Is Successful And Remains Profitable." Puh-leeeze! 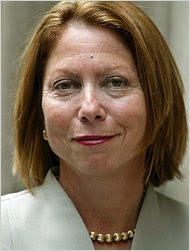 Live-Blogging Jill Abramson: "The Times Is Successful And Remains Profitable." Puh-leeeze! Three readers have just asked Jill Abramson about the future of print journalism in a web-driven marketplace. As Patrick McAlister of Fort Wayne, Indiana put it, perfectly: "How can quality, privately funded journalism survive with so many ways to get it free, unencumbered by ads?" With the severe downturn in the economy, The Times is facing challenges, though ones that are not as daunting as those confronting smaller, regional newspapers. We have had some buyouts and layoffs, but nothing like the wholesale slashing of staff that has so visibly narrowed the ambitions and weakened the news-gathering abilities of some other publications. Sure, the Times is profitable. With a depressed stock price, declining revenues, shrinking budgets, nearly $1 billion in bank debt, drags on the balance sheet (like the Boston Globe) that drop in value daily, swanky new offices it already wants to sell, a hiring freeze, and a website that -- however widely read and beloved -- has no hope of generating profits in the foreseeable future. "I suspect that new models for charging for quality news will become Topic A within the journalism profession this year," you tell McAlister. Come on, Jill, why try to delude readers? Topic A for the Times in 2009 is going to be saving itself from total economic disaster. And you know as well as anyone that charging for the internet isn't going to be the answer. It's only Tuesday. How about some real honesty for the rest of the questions this week? You never know, readers might just like hearing the unvarnished truth from the managing editor of The Times, about the Times.